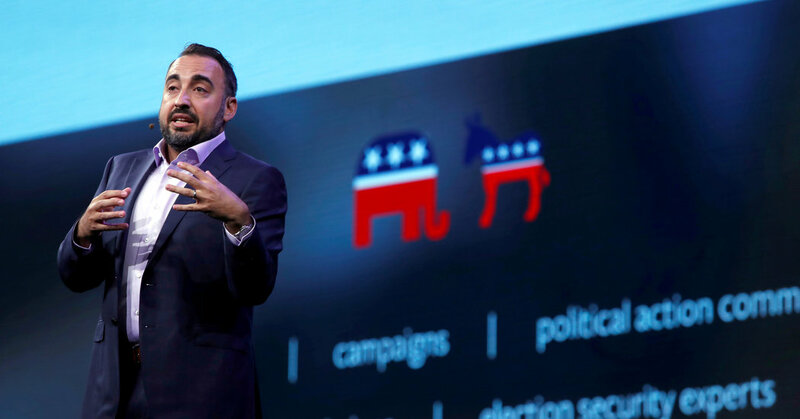 SAN FRANCISCO — When Facebook revealed on Tuesday that it had identified a political influence campaign ahead of the November midterm elections, the company’s chief security officer, Alex Stamos, was front-and-center in speaking on the issue. The timing is tricky as Facebook grapples with potential threats including election meddling and hackers. The New York Times reported in March that Mr. Stamos planned to leave Facebook in August and that his day-to-day responsibilities were reassigned to others last December, but the Silicon Valley company does not plan to appoint a successor for chief security officer. In an internal Facebook post from January written by Mr. Stamos, which was obtained by The Times, he said the company’s security team was being reorganized and would no longer operate as a stand-alone entity. Instead, he wrote, Facebook’s security workers would be more closely aligned with the product and engineering teams and focus either on protecting the company’s corporate infrastructure or its users. “The safety and security challenges we face today are dispersed across many surfaces, and addressing them requires the focus of many teams across the company,” Mr. Stamos wrote in the post. Sheryl Sandberg, Facebook’s chief operating officer, said in a statement on Wednesday that Facebook would continue to collaborate with Mr. Stamos in his new job at Stanford. “Alex has played an important role in how we approach security challenges and helped us build relationships with partners so we can better address the threats we face,” she said. Amy Zegart, the co-director of Stanford’s Center for International Security and Cooperation, said in a statement that Mr. Stamos had been working with the Stanford cyberpolicy program for several years and had piloted a “hack lab” class this past spring. Mr. Stamos previously worked as chief information security officer at Yahoo before joining Facebook in 2015. He has been vocal about cybersecurity issues. For example, in an address last year at Black Hat, a cybersecurity conference in Las Vegas, he argued that security professionals were overly focused on solving problems that were complex or bizarre and had lost sight of the everyday problems that plagued the internet. Mr. Stamos said that over the course of his career, he had worked as a consultant for all of the major tech companies in Silicon Valley. That would help in his new role at Stanford, he said. “Part of my goal is to help people find the right folks at these companies, to come up with structures in which we can have cross-disciplinary academic study,” he said, adding that he wanted to address issues including online child safety and the naming of a country or group responsible for a cyberattack. “There aren’t good norms around a lot these things yet,” Mr. Stamos said. August 10, 2018 Comments Off on Are Car Subscription Services Like Fair and Flexdrive Worth It?